We began by cutting three phyllo sheets into sixths. We then separated the squares out and placed them in muffin tins – 3 per tin. Both Mr. N and Miss A were surprisingly very good with the delicate phyllo. 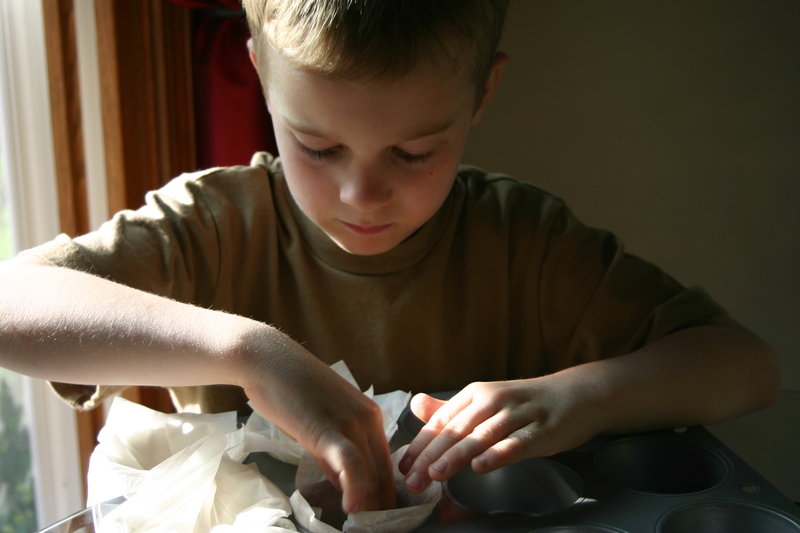 They gently layered the sheets, rotating the corners by 90 degrees each time. 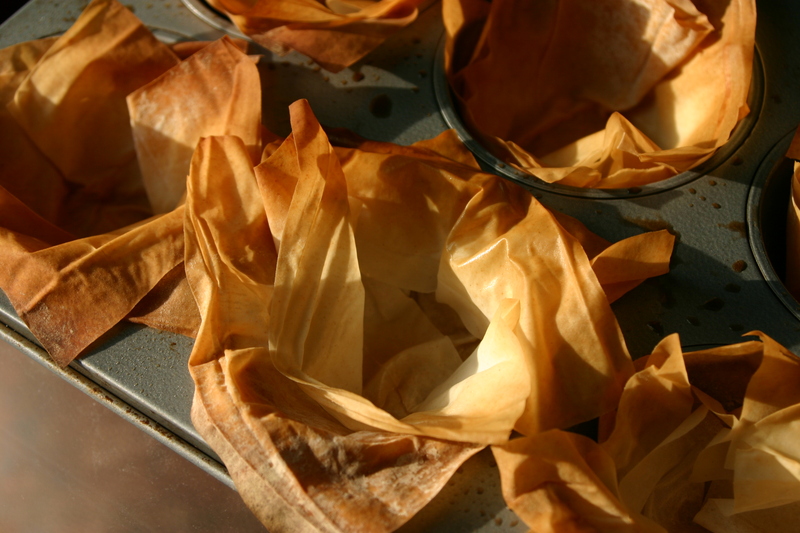 We then sprayed the phyllo with a little cooking spray and placed them in the oven at 350F for 7 minutes. Fruity Phyllo Florettes. The kids loved them (and so did mom and dad)! They were sweet, fresh and healthy. Not to mention they were a fast way to make a fun new breakfast. Here’s to the sun coming out tomorrow! Happy Memorial weekend! Third Time’s the Charm? Quest for the Best Banana Bread. 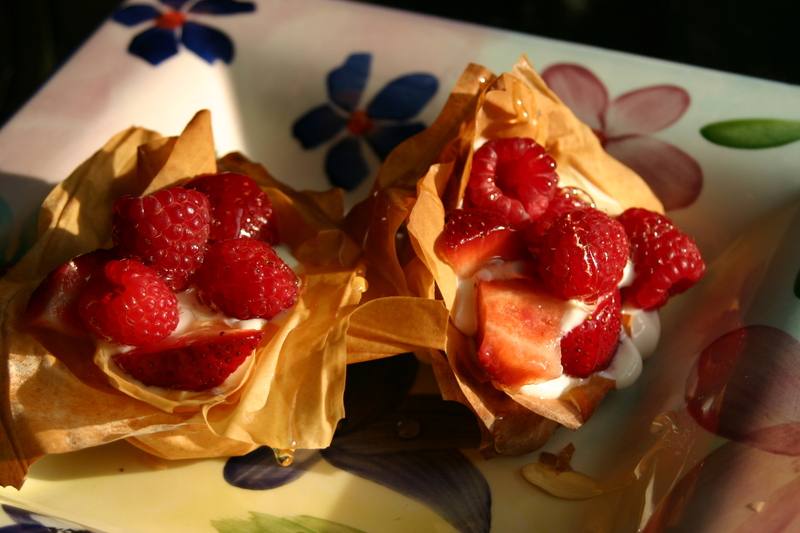 Your Fruity Phyllo Florettes are fabulous! What a great and fun idea for brunch guests. Thanks Mandy! Hope you’re having a great weekend! These look awesome – incidentally, you probably hear this a lot but it’s so wonderful that you actively have your children helping out and having fun so much. The number of people my age whose idea of “cooking” consists of “lol, boiled pasta with grated cheese” or “frozen meal in the microwave for 3 minutes”. I think food and food preparation is one of the most incredible pleasures in life and hopefully they’ll grow up appreciating this! Those phyllo fruit cups are a lovely way to start the day. You can also serve cooked pudding with fresh fruit on top in them or bake individual semolina desserts (galactoboureko recipe I mentioned in your baklava post) in muffin tins using the phyllo strips as a base and fold off the overhang to seal in the custard. Now that does sound good! What a simple, yet inventive, idea for a breakfast meal! I can imagine the flavors working really well together, from the tartness of the orange juice to the sweetness of the strawberries to the saltiness of the phyllo cups. YUM!! Thanks Caroline! We definitely enjoyed them. And it’s a bonus because it totally tastes like a sinful treat, but is really not bad at all. Love that kind of food! They were so easy and delicious! Thanks Kay have a great weekend too! I love doing the with phyllo. This is such a great recipe 1) because the flavors are so nice and 2) because it looks so fancy but is easy. Great post! Thanks Greg! Flavors are absolutely yummy! 🙂 And yep – you could totally serve this to guests. It would make a nice B&B opener for breakfast. Those look delicious and beautiful! 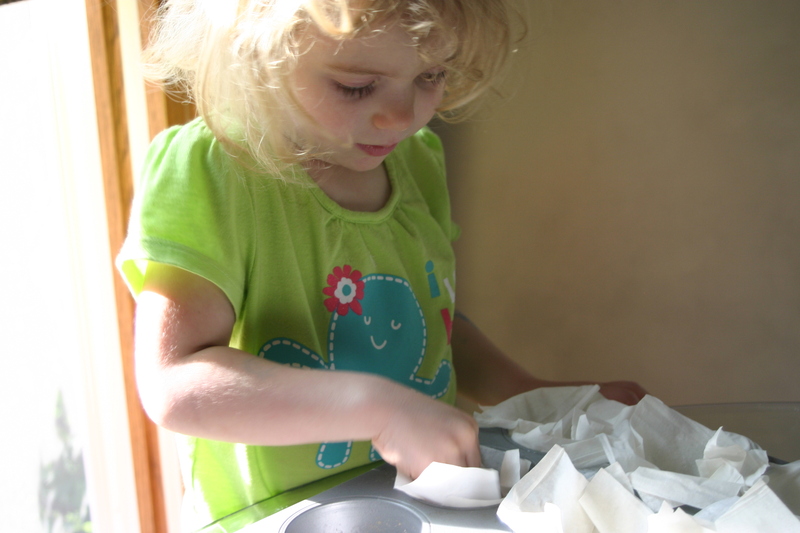 I also love to see kids in the kitchen–glad I found your blog! Thanks! I see that you and your son do a lot of cooking together too. That’s wonderful. We have so much fun and I know it’s creating some great memories (if not for them, for us!). Thanks for visiting and commenting. Have a great long weekend!